Short Term! Earn Money! Have loads of fun! Work available from September 14th thru October 31st. We are looking for energetic outgoing individuals ages 16 and up! 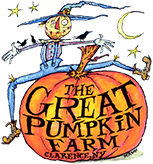 The Great Pumpkin Farm offers exciting seasonal employment in a fun, family environment. We encourage everyone, including students, stay at home moms and dads, teachers, retirees and grandparents, to apply. We are always looking for reliable employees for weekdays and weekends in the fall season. Farm Hands – looking for kids to work the parking lot, stock pumpkins and help keep the festival clean. Weekends and some weekdays. Group Tour Guides – needed for our tours during the week, Monday thru Friday from 9am to 2pm. Guide our groups on our hayride thru the woods, stop and pick a pumpkin, see the animals, visit the playground and hay maze, see the chicken show and have lunch. Store & Bakery Help – needed for weekends and some weekdays in the Halloween gift store, candy store and bakery. Contests/Activities Help – help organize and run the contests and activities during our main festival weekends. Have fun helping with the Scarecrow making, Mummy wrapping, pumpkin decorating contests and our craft section for kids. Attraction Attendants – take tickets for attractions including hayrides, cornmaze, mining, jumping pillows, etc. Applications being accepted to keep on file for the 2019 Season. Call 759-1929 to set a time for an interview and fill out an application. Download and print the EMPLOYMENT APPLICATION to bring with you.